Susan B. Anthony Dollar Coin Mount Necklace, US Dollar accented in 24K gold on .999 silver mounted in a 14K gold filled screwtop bezel with durable 20" IP gold chain, Lenscote protected. 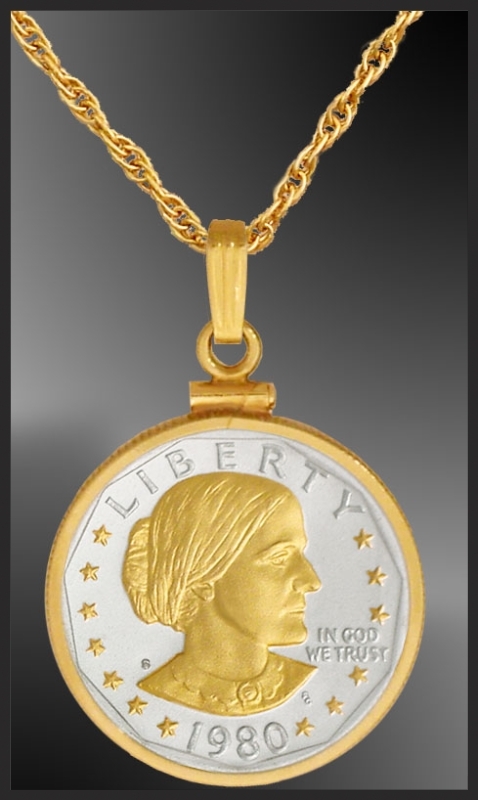 Susan B. Anthony Dollar Coin Mount Necklace. In acknowledgement of the patriotism of Susan B. Anthony, a classic styled design that stands the test of time. Mounted in a 14K gold filled screwtop bezel with 20" durable IP gold chain, this US Dollar is richly accented in 24K gold on .999 silver and Lenscote protected.